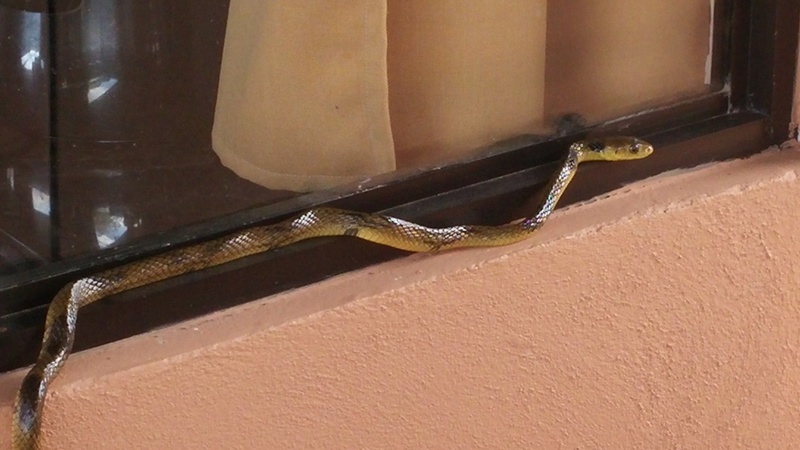 I always say “Living in Costa Rica is always an adventure”, and so this is yet another Living in Costa Rica adventure! How’s this for a visual representation of another Living In Costa Rica adventure? I just put on my shoes (no pants, no time for that!) and went out to determine if I should kill it and if I should then grab a stick or something to push it down from the window and wack it! It was about 4 feet long. I wasn’t sure if it was poisonous or not. I’m color-challenged – that is, I don’t see shades of red and green accurately which means I don’t see many colors accurately. On top of that I’ve only seen the poisonous ones a couple times so I wasn’t sure if this was a poisonous one or not. Now, I’m usually up for yet another living in Costa Rica adventure, but this is one I could do without! I ran outside to take a closer look (but not too close!). I couldn’t tell what it was from my memory and from the one picture we had easy access to, but as near I could tell it might be one of the poisonous ones. So I ran back in the house to take the above picture to send to my friend Diego who would hopefully write right back and tell me whether to try to kill it or not. So I never heard back from Diego but we kept our eye on it while waiting. It began to move away from the window and I could see it was going to get down to the ground to escape so I quickly grabbed the nearest walking stick which had curves and angles in it (i.e. not straight, but cut from a tree). It hit the ground running so I gave it a good wack! Problem was, it was NOT a good wack! It put its head up in snake-like fashion and stuck its tongue out at me and acted ready to strike. I backed up, quickly. It began to crawl off and I wacked it again. But again, due to my nervousness and the un-straight stick I missed giving it a good wack. It ran off over the hill. WHEW! I just had another living in Costa Rica adventure and am glad this one was over and ended well (they always do)! Later he told me these zopilotas related to boa constrictors and so very good to have around. They eat mice and scare off the poisonous snakes as well. So I am glad I didn’t kill it. While snakes do startle me when you see one, as to lizards, I don’t mind having them around if they eat bad things like rodents and bugs, as long as I know they are safe. Boas are one of the best to have around as they do not harm humans – at least the Costa Rica kind don’t. Here’s a page re snakes and reptiles of Costa Rica. They say exercising first thing in the morning is good for your metabolism and helps you lose weight. I’ve lost nearly 5 inches off my waist in the 9 months we’ve lived here as a result of more exercise. Well getting my heart beating like that first thing in the morning surely did increase my metaboIlism and when I went to kill it, I don’t mind admitting I was sweating a bit too! The truth is we see very few snakes, and so far I’ve only seen a poisonous one a couple times and luckily I had a Tico friend with me who rapidly determined it was poisonous and gave it a good wack or two and it was “Adios!” to that harmful creature! So there you go – another living in costa rica adventure to make life interesting and exciting! Luckily not seen any in Oz. Last person I met who did try to attack one used methylated spirits, then set fire to it and spent months in hospital after the snake ran away laughing.